The world is quick to label Darko Milicic an epic NBA bust, but here are 10 reasons he is an utter success. This story appears in Spanish here. 1. He doesn't mind talking about being a total failure. Darko Milicic uses the word "bust" a lot, which is surprising. I thought he might avoid it or at least make a sour face when it comes up, but he doesn't stumble over it, doesn't stutter. It doesn't catch in his throat like phlegm. No, Darko is frontal. He is blunt. At 7 feet tall and approaching 300 pounds, he's roughly the size of a garage door, but, within the first 10 minutes of meeting me, he uses the word "bust" a half-dozen times in a variety of ironic ways ("This isn't just about how I'm a huge bust, right?"). He jokes about being memorably dreadful, bringing up the 2003 NBA draft when he was the second pick -- right ahead of Carmelo Anthony, Chris Bosh and Dwyane Wade, and right behind LeBron James. He pretends to be talking to those players, raising his hand in the air and telling them that, statistically, someone from the group is bound to be a nightmare so, fine, "You guys be the best and I'll be the" historical smudge mark. Then, he belly-laughs. During our interview, which runs nearly three hours, he peppers the conversation with "bust," occasionally breaking it up with appropriate synonyms, like "disaster." At one point, he says "bust" three times in about 15 seconds and punctuates the description of his professional basketball career by stamping an imaginary label -- presumably one saying BUST -- on his own forehead. The whole thing feels like part performance art, part therapy. The obvious question then: Was he really that bad? The short answer: Yeah, pretty much. There are lots of ways to quantify how much of a disappointment Darko was in the NBA (starting with the fact he averaged 6.0 points per game while making around $52 million). The simplest way to understand it, though, is this: Basketball-Reference.com has a feature where it combines all of a player's statistics and lists other players who had careers similar to his. For LeBron, the similar players include all-time greats such as Julius Erving, Larry Bird and Charles Barkley. For Bosh, the list has Hall of Famers such as Dominique Wilkins and Alex English. Wade compares to Clyde Drexler and Walt Frazier. Yet Darko seems fine with all that, fine with being one of the most famous scrubs in the history of the league. Somehow, he's good with it. And so, one afternoon this spring when we are driving in Novi Sad, which is Darko's hometown in Serbia, I casually mention that I did not expect him to be so at ease with the calamitous quality of his career. "What did you expect?" Darko asks. I hesitate. I'm trying to figure out how to say "unbridled disgrace" in a way that isn't completely offensive. "You know, I once wrote a story about Frederic Weis," I say, bringing up another basketball catastrophe from Europe -- this one French instead of Serbian -- who was drafted by the New York Knicks in 1999 but never played a game for them. Darko's face perks up. He remembers Weis. "He was sad and depressed," I say. "He had a lot of other issues going on, too, with his wife and his son, but he still seemed pretty angry about how everything turned out and he was angry at life, and I guess it was under-the-surface angry, but angry." "Actually, Weis tried to kill himself once," I blurt out. We ride in silence for a minute. There aren't many stoplights here and the road is a little bumpy and the radio is on, with Serbian music playing low. It seems as if maybe I jabbered the conversation into submission. But then, abruptly, Darko says, "That's weird, you know, about Weis, because I kind of feel like Old Darko died. Like, when I think about myself, or myself when I was playing, I feel like I'm sort of thinking about someone who is dead." 2. He no longer believes that, because of a combination of peer pressure and societal customs, he should lie about his dream. Darko was 18 when the Detroit Pistons drafted him. Before that, he lived in Serbia during the 1990s, which meant he saw his country -- and his father, who was a soldier -- fight in several wars in the Balkan region. He also lived through NATO bombings that decimated his city, forcing him and his parents and his sister to spend days on end in their basement, listening to the whooshes and thumps of explosions above. Once, during the war in Bosnia in the early '90s, as his family watched television, there was a news report about how 15 or 20 Serbian soldiers were killed that day. One of the names the newscaster read was Milorad Milicic. Darko, who wasn't even 10 yet, remembers looking up and seeing a picture of his dad on the screen. "Why is Daddy on the TV?" he asked his mother. His mother didn't answer. She just started crying. So Darko cried too. But then about five minutes later, the newscaster said it was a mistake. Some of the names were wrong. "I'll never forget what that felt like," Darko says. "All of a sudden he was gone. All of a sudden he wasn't." Milorad came home. And, among other things, he taught Darko how to play basketball, showing him shooting techniques on a hoop just down the hill from the house. It wasn't because either father or son had a particular love for the game, though. It was mostly biology. "My father taught me because there were people from the village who said, 'You're tall -- why not try?'" Darko shrugs. "I wasn't the one that asked to play basketball." Still, basketball turned out to be something he was good at. And because of family encouragement, and the same kind of teenage inertia that makes kids stick with the tuba for six years even though they're only sort of interested in music, Darko kept doing it. He moved to Hemofarm, a professional club in the city of Vrsac, when he was 14. Basketball became his purpose even if it wasn't his passion. By the time scouts started coming around, Darko saw the NBA as a way out -- of financial insecurity, of persistent tumult, of Serbia -- more than any kind of childhood fantasy coming true. He liked the game enough. Everyone he met was rooting for him to go. It was all right there in front of him. And who hasn't walked through a door simply because it was open? The problem is that wasn't the narrative we expect from foreign basketball players. We expect them to love the NBA, to have grown up watching it on choppy internet streams or satellite television, to cherish its players and aspire to its trappings. When Yao Ming came to the NBA from China, he made no secret of his longtime adoration of Arvydas Sabonis and Hakeem Olajuwon; more recently, Kristaps Porzingis, a Latvian, made it clear that Dirk Nowitzki was his inspiration, and everyone nodded. So, as soon as Darko began to get some attention in the U.S., the expected questions began: "Who was your idol? Who did you love to watch? Kevin Garnett, Darko answered. He told everyone that Garnett, a tall power forward with a wingspan wider than a school bus, was his muse. He told local television stations he liked Garnett. He told USA Today he liked Garnett. He told ESPN he liked Garnett. Except he had barely seen Garnett play. "I just sort of found him and decided he's the one," Darko says now. "It seemed like the player I was supposed to like." Supposed to -- that was Old Darko's existence, wasn't it? He was tall, so he played basketball. He was good, so he went to Hemofarm. He got noticed, so he went to America. He needed an idol, so he made one up. He followed the trail wherever it led. There was no hazy image of grandeur in his mind's eye, no sweet moment of make-believe lolling about in his brain. He was dreaming with the lights on. Now that basketball is over, though, it is different. Now, he does fantasize about a passion. Now, he does have a picture of something that makes him smile. See, Darko got into commercial farming after basketball. 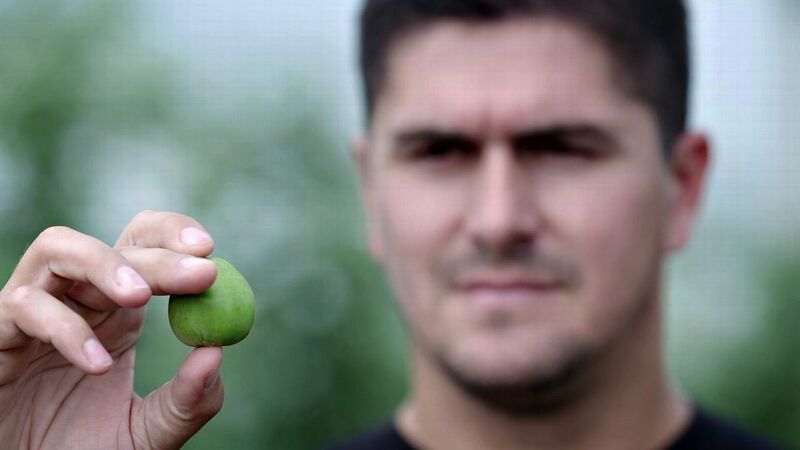 Some athletes do real estate or clothing -- Darko did fruit. Don't be confused: His farm is more Dole Plantation than Old MacDonald. He has 125 acres filled with apple trees and exports the apples to Dubai, Russia and countries in Africa. Cherries, though, are his vision. The financial return on cherries is tremendous, Darko says, and the market is wide open. When Darko talks about cherries, his eyes get wide. He gets passionate. He gets animated. "I want to make these cherries," he says during the only moment we are together when he sounds wistful. "I think it's time." E:60 showcases the best in longform television journalism. For more, tune into E:60 at 9 a.m. ET on Sunday on ESPN. 3. His typical evening routine no longer includes damaging his own home. Darko doesn't punch walls anymore. He punches heavy bags occasionally as a way to get exercise, and he once punched a horse in the face (more on that later), but his days of regularly inflicting punishment on the walls around him are over. This is an important change. When Darko was playing in the NBA -- well, not exactly playing -- he would often return to his apartment after stewing on the bench for yet another game and channel his rage toward the typically thin, American Sheetrock walls. The worst was in Memphis. Darko's wife, Zorana, who was living with him then, calls that his "crisis period." The team was losing. Darko was infuriated. And the walls in that apartment looked like cottage cheese, a mess of bubbly bumps and curds. The sequence was familiar: He would come in, hammer on the walls and go to sleep. In most cities, he came to know the local contractors who could run over, throw some putty up and do a quick cover-up job with whatever paint they had handy. "You know you have exactly white, and then the other white, and then gray?" Darko says of his patchy walls. "That was my house." Darko had always had outbursts. He called them "going crazy." Mile Ilic, who met Darko when they were both teenagers, says sometimes Darko was just inexplicably petulant -- he would stop practicing or not want to do a drill or not think he should have to help clean up the gym -- and the coach would punish the rest of the team. "At those moments, you simply start hating him because you have to suffer for it," Ilic says. "It would last for five or 10 minutes and then he would be a totally normal character." By the time Darko reached the NBA, however, his emotions were more complex. At first, he was just a teenager, an ocean away from home in a culture he didn't understand. For example, Darko would go home to shower after practices or games instead of staying in the locker room to clean up; he didn't realize that in America, the players all showered together. "So I had to teach Darko," says Chauncey Billups, who played in Detroit from 2002-08, "like, no, when we're done playing, when we're done practicing, you put your towel on and you go get in the shower. That's what we do here." It wasn't long, though, before the naïveté melted to anger. Pistons coach Larry Brown didn't have a lot of interest in playing Darko because Detroit had received the No. 2 pick in a trade and had a slew of skilled veterans at the time. Also, when Brown did play Darko, he wanted him to work near the rim instead of passing and shooting from the outside as Darko preferred. Darko quickly plunged into a near-perpetual pout. There was wall punching. There was also drinking, and Darko began showing up to practice still tipsy after an overnight bender. "I just wouldn't sleep," he says. It was classic high school behavior: He couldn't be the star, so he decided to be the bad-boy rebel. "I don't have any regrets about how we treated Darko," Brown says now. "I have regrets that he couldn't have been more mature and patient." The same thing happened in Orlando. And with Memphis, too, where Darko was so unhappy that he went off on a rant against the referees after an international game that was immortalized on YouTube. (Darko used such graphic profanity even the reporters interviewing him tried to calm him down.) "Everywhere I went, it was just the littlest thing that would set me off and I'd flip," Darko says. You know the craziest thing? All that wall punching ... and the two times he ever broke his hand came when he was actually on the court. In Memphis, he cracked a bone in his right hand against Indiana. And in his first season, when Detroit was on the verge of winning the NBA championship over the Lakers, Brown finally put Darko in, an opponent smacked him while he was shooting a jump shot and his hand shattered. "I was trying to show Larry Brown my hand because my hand was like shaking," Darko says. "He just pushed me back in the game." Darko rolls his eyes when he talks about it now. He hasn't punched a wall in a while, he says, and Zorana says the same. Darko jokes that the reason is because Serbian houses are made from masonry, with textured wallpaper stuck on top of stone. The walls in Serbia don't have any give. Zorana thinks removing the intensity of basketball from Darko's life was the key, like taking the lighter out of a gas grill. Now, she says, the sequence at night is: Darko comes in, has dinner with the family and watches television before (sometimes) dozing off on the couch. It also isn't basketball that Darko watches. He actually does not follow the NBA much at all, he says, and he isn't kidding: I first meet Darko in June, just days after the Golden State Warriors took a 2-0 lead on the Cleveland Cavaliers (featuring LeBron) in the NBA Finals. Anyone with even a passing interest in the sport knows about the battles between LeBron and Stephen Curry. But when I ask Darko about the series, he looks genuinely surprised. We are sitting at his farm, and Darko glances at the fields. "The Finals are going on now?" he asks. "Who is winning?" 4. He knew when to quit. On Nov. 17, 2012, the Celtics had a game against the Toronto Raptors. That day, as the players were filtering into the locker room, Darko knocked on Doc Rivers' office door. Like most of Darko's coaches before him, Rivers did not see Darko playing a significant role on his team. To that point, through nine games, Darko had played a total of five minutes. But Rivers liked Darko, liked having him in practice. So he welcomed Darko into his office and listened as Darko told him he had come to say goodbye. "In the center position, if something goes bad for the team, you have [Jason] Collins, you have [Fab] Melo," Darko said. "So I'm packed and going home." Darko recalls Rivers being stunned. "Darko, what are you talking about? Where are you going? You are going to play tonight." Darko was unbowed. "Doc, that's it. I'm not playing tonight, I'm not playing ever again. "Thank you guys for trying. It didn't go well. I'm out." When Darko went into the locker room to tell his teammates, several didn't seem to understand. He was leaving? Like, for good? For good, he told them. It was over. Publicly, the Celtics said Darko had asked for his release so he could return home to be with his mother, who was sick. In truth, Darko's mother had a minor illness -- and recovered just fine -- and Darko had been planning his exit for a while. Finally Boston took its shot, stepping forward like the last in a line of children taking swings at an empty pinata. "Everybody was trying to find a way to keep me," Darko says. Leaving, then, even in the way he did, was the moment when he took back control. Is Darko a quitter? It seems too easy a label. In Darko's mind, Boston was simply the time when he decided to stop thinking everything was suddenly going to change. There was some measure of survival in it, too; over nine years, the water had risen to Darko's chin so many times it was easy to understand why he felt certain he was about to drown. "I was so lost," Darko says. "I really came to hate basketball, you know? I just wanted to come back home and live another life." Zorana had packed everything, and the family flew back to Serbia the day after Darko's conversation with Rivers. For a while, he felt relief. Then, he felt itchy and idle. Then he partied. Then he toyed with playing again, almost making a comeback with a Serbian team. Then he had a much-publicized midlife crisis (which is not unreasonable at age 29 when you turn professional at age 14), during which he became a kickboxer. He fought once. On the night of the bout, Darko stepped on the scale for the prefight weigh-in and broke it. Literally broke it. "It took us one hour to find another scale," says Darko Popivoda, the promoter of the fight. "Darko stepped on that scale, and that scale also broke." At that point, Popivoda just asked Darko how much he weighed. Over 300 pounds, Darko sheepishly said. Things did not improve in the ring. Darko had a strong knee but says he "forgot" to use it. He had a good left high kick but kicked primarily with his right. "I mean, I want to kill him, but I don't know how," Darko says. His opponent, who was much smaller, did know how: He whaled on Darko until his legs were bleeding so badly he couldn't stand up. Darko's family was "not really that happy" with his decision to fight, he says, and one evening, when we are chatting quietly, Zorana describes it to me as "stupidly stupid stupid." Her feelings (along with the ease with which Darko was dismantled) led Darko away from another kickboxing engagement and toward a quick second sports retirement. It seemed a wise decision. Instead, he became intrigued by agriculture. A few friends were farmers, and that was appealing, but the element that drew Darko was the idea that he could master it. He was supposed to be a basketball wizard; that hadn't quite worked out. Farming was another chance. Darko quickly became hooked. He traveled to Italy to look at famous orchards. He learned about soil and growing patterns and tree heights. He considered other types of fruits, then, after settling on apples, reviewed the varieties. Darko's passion is real. When an unexpected snowfall damaged about 10 acres of apples this spring, he went out with the workers to try to salvage the crop. And last year, when he walked through the orchard during the first picking season, he experienced a sensation that, he says, was foreign to him: pride. "I was just really happy," he says. "You know, we were picking our apples. Ours." 5. When he goes drinking now, he uses his hands (most of the time). In April 2015, Darko and his friends were at a party. There was beer. There was singing. There was lots of shouting and laughing and men raising their arms in the air. All pretty standard. But at one point, Darko got up near the front of the crowd and, shirtless, inserted a bottle into his mouth. He then removed his hand from the side of the bottle and tipped his head backward, as if swallowing an aspirin. He remained in that position until the bottle was empty. It was a remarkable bit of drinking agility -- one that was immortalized in a much-watched video on the internet -- even though much of the beer ended up on his neck and face and shoulders. Darko then grabbed another beer bottle but, instead of chugging it, leaned over to give gentle sips to the two Chetnik commanders he has tattooed on his torso, essentially pouring beer on his own stomach on purpose. To me, there are two things that stand out from this display. The first is the prominence of Darko's tattoos. The Chetniks were a group of Serbian nationalists during World War II, and history doesn't quite agree on how cooperative, or combative, they were with the Axis forces during the war. In an effort at clarity, I ask Darko to describe himself politically -- like, why does he have those men tattooed on his stomach? -- and Darko says he is a nationalist but adds that the label doesn't mean the same thing in Eastern Europe as it might in the United States. Darko's feelings about Serbia are complicated -- the wars, the fighting, the instability of his childhood -- but can ultimately boil down to this: He says of his country, "I love mine, and I respect others." It's a big part of the reason he moved back to Serbia instead of remaining in the United States after he had finished playing, like so many foreign athletes do. Serbia is his home. The second thing that stands out about the video is how alone Darko looks despite being in the middle of a crowded party. His face is blank and empty. His eyes are glazed beyond the standard hammered-drunk stupor. He is in his own world. And the hands-off-the-bottle thing, while physically extraordinary, is the ultimate solo trick: It requires nothing -- not even one's own fingers as company -- to accomplish. A few days after I first meet Darko, he has a party at his house. It is a cookout in the late afternoon, and his friends bring their wives and children. The kids jump on the trampoline. The men play (remarkably shoddy) basketball on the half court. Then there is dinner, and Darko -- in a Serbian tradition -- walks around the table with a bottle of rakia, or fruit brandy, pouring a shot for each guest and standing nearby as the guest enjoys it before moving on to the next person. Darko does not take off his shirt. He does not let go of his glass. He does not water his tattoos. He is never alone. 6. He kept the cars. In addition to teaching Darko how to shower, Billups taught Darko how to drive. It was not always easy. In particular, Darko seemed to have a disagreement with Billups on the appropriate way to proceed from one road to another. "I'd say, 'No Darko, hold on, you've got to slow down when you're turning,'" Billups says. "He's speeding up when he's turning, and I'm like, 'No, you can't do that.' It was scary." Fortunately, Billups survived. Darko got his driver's license. And, shortly thereafter, he began to build a fairly remarkable collection of cars. Over the next nine seasons, Darko spent time with the Pistons, the Orlando Magic, the Memphis Grizzlies, the New York Knicks, the Minnesota Timberwolves and the Boston Celtics. Thanks to the thick-headedness of a remarkable number of basketball executives and the wonders of the NBA's guaranteed contracts, he earned $52,323,642, and he bought a new car at nearly every stop. Now, walking into the driveway of Darko's mansion in Novi Sad (where $52 million will last "about 200 years," Darko says), it is impossible to miss the luxury cars clumped together like pachysandra. Over here is a Porsche Panamera with Minnesota license plates still on it. Over there is a Range Rover with New York plates. A Mercedes S600 by the turnaround? Tennessee plates from that hot mess of a stay in Memphis. It is not entirely clear why the cars still have American license plates -- Darko makes an obscene (but funny) gesture when asked about it that seems to imply Serbian registration is, in his opinion, optional -- but there they are, gleaming symbols of Darko's misadventure in the United States stuck right out in front of his house. Why does he keep them? Part of it might be vestiges of the old superstar lifestyle and, more likely, part of it is that there aren't many cars that are comfortable for a man so tall. But there is something more, too. Darko moved on quickly from so much of the NBA, even selling his Pistons championship ring and donating the money to charity. The cars, though, he kept. "I've had it priced a few times, but they tell me that even a small fix for an American truck like that is thousands," Darko says. "They try to rob me." "Do you need it?" I ask. Darko shakes his head. "So why not get rid of it?" We are standing about 20 feet from the truck, and Darko gazes over at it. "Never," he says. He looks back at me as if I am crazy. 7. He didn't go broke. Darko's property in Novi Sad has a giant fence around it. There are three main buildings -- the house, the guesthouse and the indoor pool. There is also an outdoor pool, a playground, the basketball court and a covered, open-sided lounge space filled with outdoor furniture. The dining room in the guesthouse -- or, put another way, the backup dining room -- has seating for 18. The basement of the main house is Darko's hunting room, where the mounted heads of everything from deer to elk to bears peer out with hollow eyes. Off the back of the guesthouse is a weight room that has a squat rack, leg presses, benches, fly machines and 100-pound dumbbells. There is a fire pit outside. There are 14 bicycles, tricycles and scooters lined up against a wall. Instead of a typical mudroom, there is an area that looks like a sliver of an NBA locker room, with cubbies that wouldn't seem out of place at Madison Square Garden and, on the walls, a giant picture of Darko dunking (while with the Knicks) as well as a framed Darko jersey from his time with the Timberwolves. I mention all this because it is important to remember that Darko retired in 2012. According to one study from 2009, about 60 percent of NBA players file for bankruptcy within five years of leaving the league, and Darko -- despite his failures while in the United States -- is still flush. On the surface, Darko's life is good: He has invested about $8 million into his apple orchard, and growth has been steady. He has about 125 acres now, with an eye on more (plus the cherries). His kids go to a plush private school. Zorana has started her own fashion line and runs a couple of boutiques. Their compound has a staff that helps with laundry and dishes and child care. But Darko is leery. He feels conflicted about giving his children such a lavish, easy life because he worries that they will take from it the same thing he took from being a basketball prodigy: arrogance. That is why, when Darko's son Lazar asks Darko about basketball, Darko is honest. He doesn't tell glory-days stories (there aren't many anyway). Instead, he tells Lazar the worst parts. He talks about not playing, about mouthing off to the coaches, about not putting in extra work. He talks about his own mistakes, his foolishness. He talks about blowing his chance, even if he didn't blow his money. "I'm not scared to tell them," Darko says one afternoon. But sometimes Lazar gets confused by what he is hearing. "When I told him, 'Don't do everything that I did if you want to be good,'" Darko says, "he was like, 'Why? You're my father.'" Darko shrugs. "Yeah, I'm your father," he said to Lazar, "but your father made mistakes so you don't have to." "You know, he still doesn't really understand," he says. "But he's going to understand in time." 8. He is able to say "this is a funny story" (as opposed to viewing it as a metaphor for his entire life). In the middle of Darko's farm is a lake. Darko had it built. It works in combination with a water treatment system that harnesses rainwater and irrigates the orchards. Above the lake is an elevated dock that includes a small (but air-conditioned) sitting room and porch where Darko can look out over his land and his water. There are 10,000 fish in the lake, and they are mostly carp. Darko bought them and stocked the lake because "the poop and the pee are good for the apples," Darko says. The fish are aggressive. When Darko throws food off the dock, there is a frenzy of swimming and flapping and snapping that makes the water look as if the lake also has whirlpool jets (which, to be honest, wouldn't have surprised me). One day, Lazar says to Darko that he wants to go fishing. Lazar is adorable, a precocious 8-year-old with a soft face and lanky arms and a small dimple. He has big hands, like Darko, but a tiny and determined smile. Sometimes, when Darko is talking to someone, Lazar will just come up and lean his entire body weight against Darko's legs, nuzzling against his giant of a father. Darko tells Lazar that fishing is no problem as there is a boat in the lake. He brings Lazar and his 5-year-old sister, Lara, up to the lake (the little brother, Luca, 4, stays home). Darko is excited -- he sees how the fish react when he throws food in the lake, and he can't wait to see Lazar's face when Lazar catches dozens of fish. Darko and the kids get in the boat. They float away from land. They bait their hooks and drop them into the water. Nothing happens. They move to another part of the lake. Still, nothing. Darko can't believe it. There are literally 10,000 fish in the water. He knows, because he paid for them. But not one is biting. "Daddy, let's go," Lazar says. "What?" Darko is flummoxed by the entire situation. "Let's go," Lazar says again. "There are no fish here." Once, when Lazar was about 5 or 6, Darko took him riding on a big horse. Horses have forever been part of Darko's family life -- his parents had a farm, and there were always animals around -- and, even now, despite being the size of a small SUV, Darko still likes to ride. He likes that Lazar is interested in something his father enjoys. These days, Darko rides a horse named Astor, who is a 12-year-old "really, really big horse" that the stable in Novi Sad found for him. Darko finds riding peaceful. But on this day, it was Lazar in the saddle, and as Darko watched by the railing, the horse took off. All was fine, but then the horse began to buck and Lazar began to tremble a little bit and suddenly the boy pitched off the side of the saddle, hanging upside down alongside the horse's flank. Darko screamed. One of Lazar's legs was caught in a stirrup. His body shook limply, banging against the horse's flanks. His tiny head dangled near the horse's hooves as the animal galloped. If Lazar fell, he would be trampled. When Darko tells this story, over a traditional Serbian lunch plate of meats one day, he laughs nervously. I think it is because he knows that none of it -- the parenting, the abject fear, the animal violence -- sounds particularly good. But Darko tells the story because he sees a lesson. When he was playing basketball, Darko says, he never thought he had done anything wrong. Everything was always someone else's problem, someone else's fault. Larry Brown didn't play him the right way. His teammates didn't realize how much he could help them. The referees screwed him. Now though, Darko sees things differently. "I blame myself," he says of what happened to Lazar (and the horse). He shouldn't have let Lazar on that horse in the first place, and he knows that uppercutting the horse afterward was not reasonable, either. "I didn't train him," Darko says. "It's on me." He pauses, eating a sausage and looking out the window of the restaurant where we are eating. His face changes from stony to soft. "After that, I asked Lazar if he wanted to ride again," Darko says. "I thought he was done. You know what he told me? 'I want to ride a bigger one.'" 10. A Serbian monk says so. On one of my last days in Novi Sad, I go to the monastery Darko attends, which is tucked into a green nook of the Fruska Gora mountain about 25 minutes from Darko's house. The Novo Hopovo monastery is striking. Clusters of deep red roses line a path to the curved entryway. A rising church with a towering cupola shoots above the tree line and into the clouds. The monks know Darko. He comes here often. One of them, Father Joanikije, says that one of the most important elements of Serbian Orthodox ritual is the notion of communal prayer. It is not enough to just perform the liturgy; it must be done together, and, afterward, people gather in this tranquil place and talk. Not just about religion or faith or scripture but about life. They share. Darko never leaves early. This is where he comes for reflection and confession and expiation, and each time, he finds himself thinking about something else he should have done differently when he was playing basketball. He relives the moments that feel the worst. "You have to talk," Darko says. "When you have something inside you that's killing you, it's eating you inside, you have to talk to somebody. That's the only way you're going to take it out." The monks see Darko differently than everyone else. When I ask Father Joanikije what he thinks of Darko as a person, he pauses for a beat or two, then says, "A man who succeeded in life. A man who achieved his goal." The words sound odd. In all the conversations I have had with people about Darko (including with Darko himself), Father Joanikije was the only person to use that kind of language. Everyone else talks about potential lost or wasted, opportunities that weren't quite seized. Darko wasn't ready. Darko wasn't smart. Darko wasn't mature. Darko couldn't handle it. Darko rebelled. Even Darko stamped his hand on his head and said he was a bust. But the monks see none of that. They just see a man who has a wife and children and a business and a comfortable life and a place in the community of his hometown. They see a man who achieved his goal or, at the very least, is trying to right now. So why can't they be right? That evening, during the party at Darko's house, I watch him play basketball with his friends. He laughs and jokes, even when shots clang off the rim. No one remembers the score. In the middle of the game, Darko runs over to the fire pit to make sure his potatoes are cooking properly. He shoots with Lazar while the other players get water. The sun sets. The players move a little slower. Darko dunks but winces afterward, rubbing his shoulder. Little Luca rides a toy motorcycle around the court. Lazar jumps on the trampoline. Zorana plays with Lara on the slide. The game ends. The men retreat to the patio. Darko checks on the potatoes again. He says, "It's a beautiful night, right?" and turns on some Serbian music. He pours drinks for everyone and takes one for himself. Then he sits at the head of the table. His friends shout a toast of love for each other, and for Serbia. Darko stretches his arms out and sings. The NBA feels far away, and he is not a bust tonight. Not here. The glasses clink, and the basketball rolls off into the grass. Sam BordenBorden is a senior writer for ESPN. He previously worked for The New York Times as a foreign correspondent based in Paris.